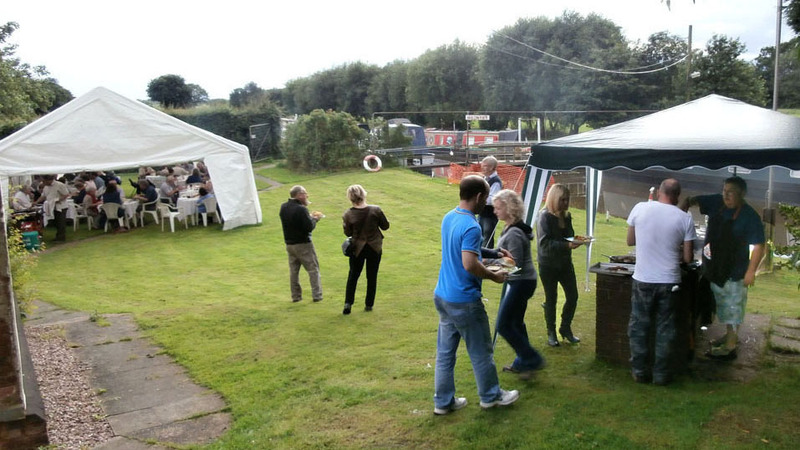 On 21 / 22 September 2013, the Huddlesford Junction site was thrown open to the public for a major festival to commemorate the 25th anniversary of the formation of the L&HCRT trust. A selection of Doug Swain's pictures from the weekend. 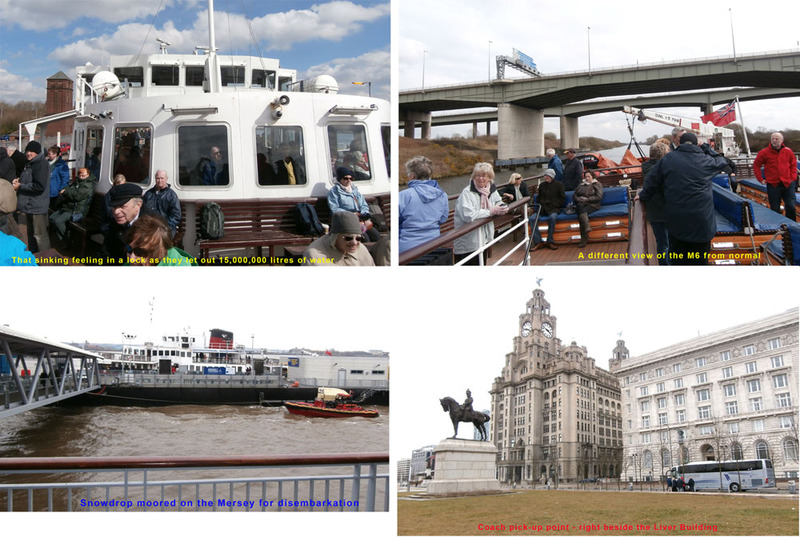 A selection of Bob Smythe's photographs of the heritage boats taken over the weekend event. After helping out a neighbouring farmer with his irrigation, the Club had the offer of a tour of his 3,000 acres plus as much strawberries and cream as we could eat. Our Commodore fixed it up for Friday evening, 26th July. 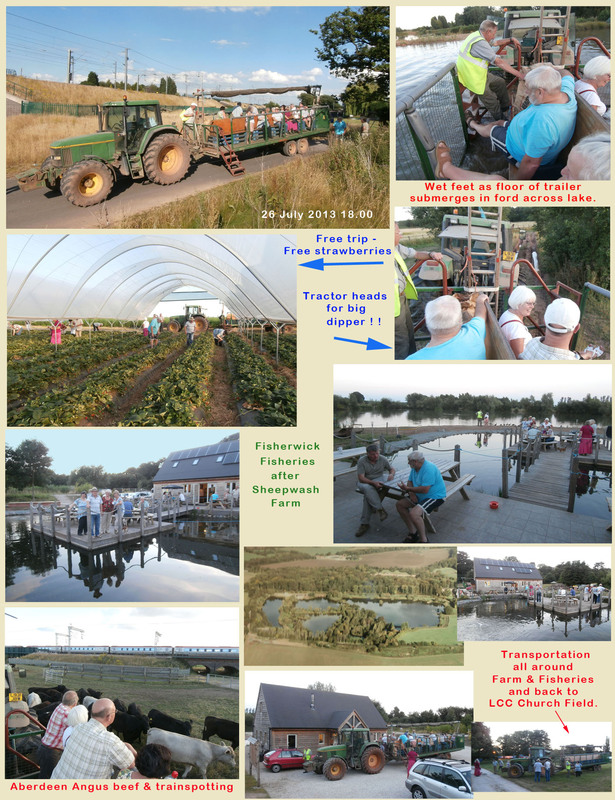 We were picked up from our gate, entertained, educated and fed, with the help of several million potatoes, acres of wheat, a herd of Aberdeen Angus cattle, poly-tunnels full of strawberries, fields of asparagus, rotating solar cells, a fishery and too many other features to remember. 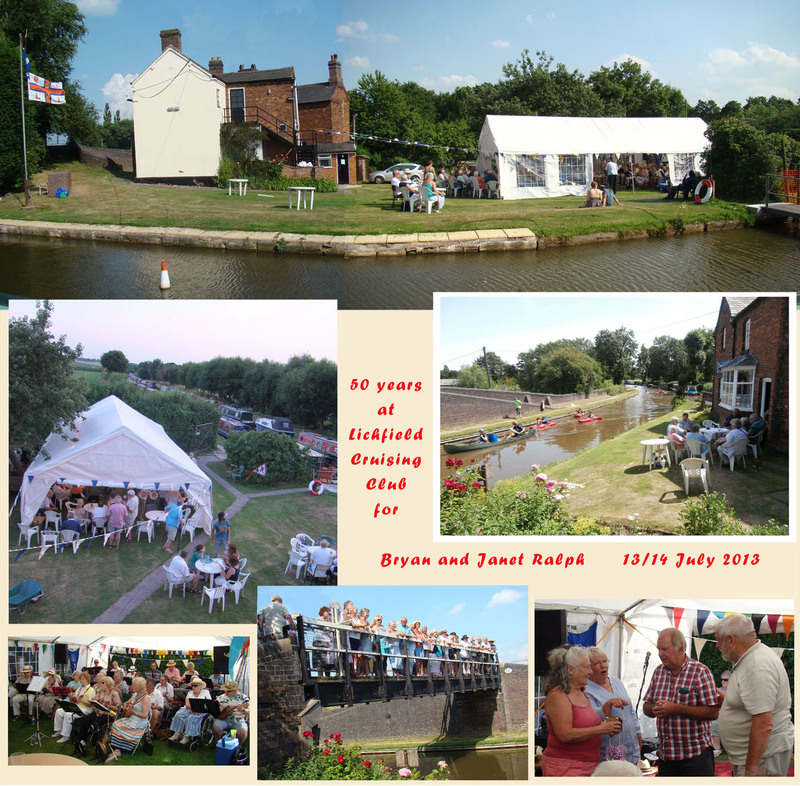 Bryan and Janet's membership actually pre-dates the current name of the Club, but they have had a boat at this site since 1963. Over the weekend of 13 / 14 July 2013, at the height of the much awaited heat wave, a string of events was planned. Guests from other local boat clubs, Towpath Talk and RNLI were invited to join in and many camped on site for the duration. On Saturday, a midday barbecue was organised with Sangria and a special real ale available extra to the normal bar. A 25 strong ukelele band (Go Ukulele Crazy) provided entertainment with lots of audience participation, followed by a full barbecue meal, a performance in two sessions by Chase Mist, a five piece band, followed by a fireworks display. 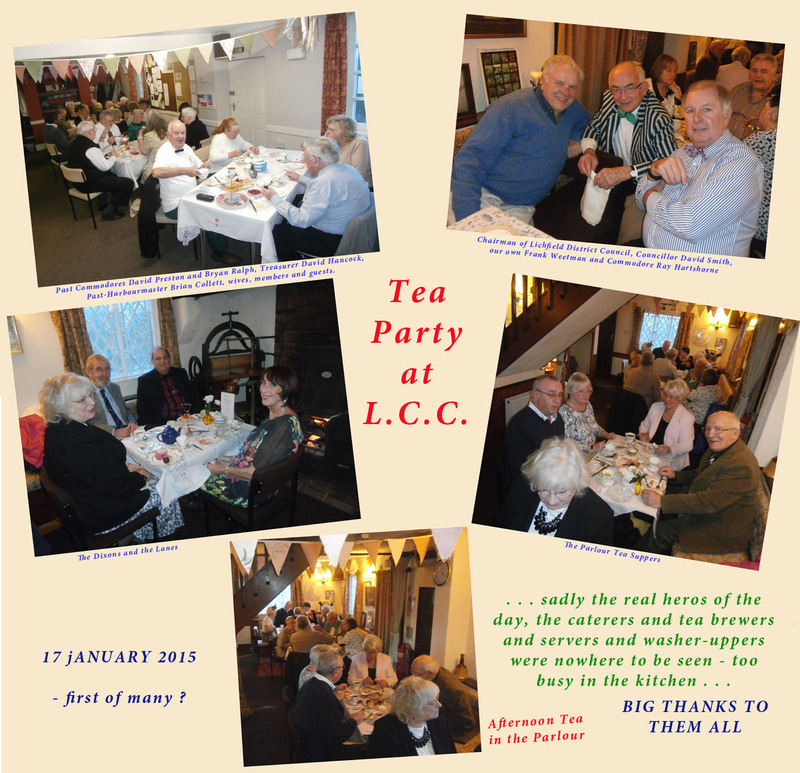 On Sunday, members and guests enjoyed a full English breakfast, and the usual opening of the bar. On their way to the Thames for the Queen's Diamond Jubilee Pageant, 'President' , the world's only steam powered narrowboat still cruising, and the butty, 'Kildare', cruise past the clubhouse at 15.45 on 22nd April 2012. A keen group of members brave the rain to cheer and wave. 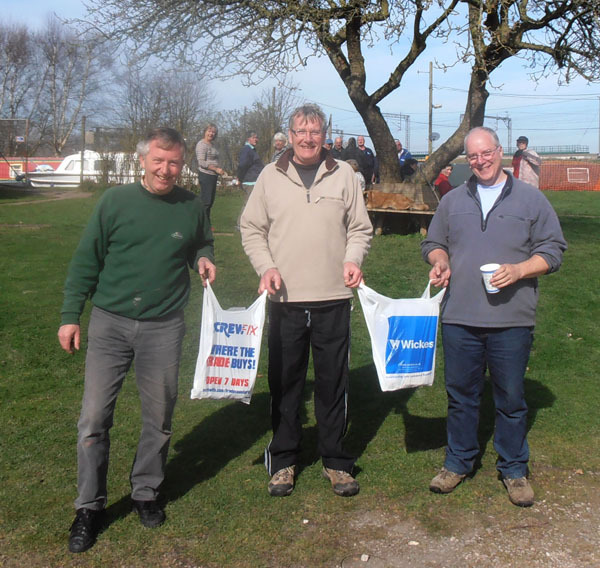 Chairman, Allan Pennicott (centre), and Maintenance Directors, Doug Swain (right) and Roger Hartley (left) celebrate a very successful, sunny weekend, when as many members as could make it got together to improve the Club's facilities, by splashing out on extra nuts and bolts. 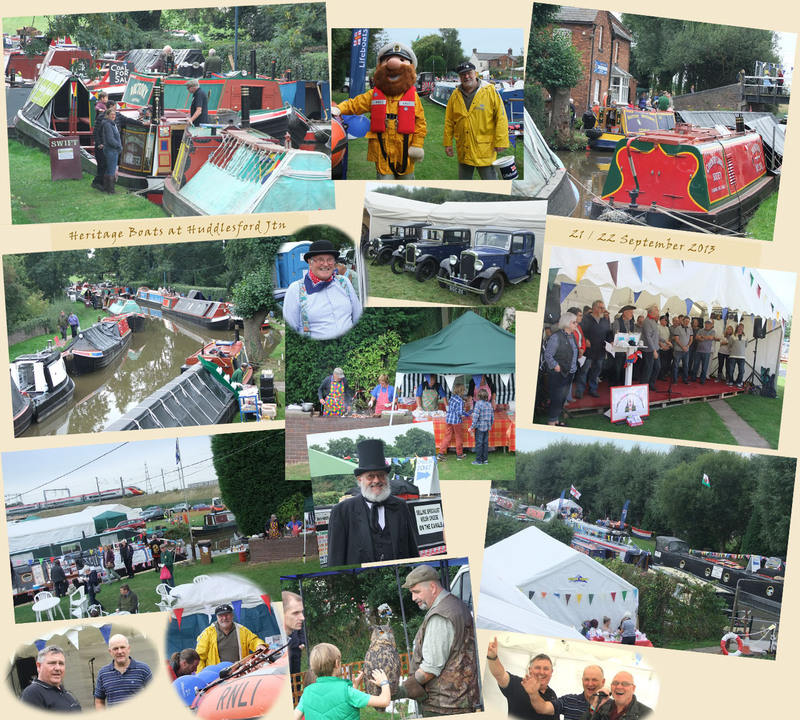 The Huddlesford Gathering 2011 took place on Saturday, 17th September, organised by the Lichfield and Hatherton Canals Restoration Trust in conjunction with Lichfield Cruising Club. Flyer found here. Sunday 26 June 2011 was a good day for the residents of the mooring to get in a bit of sunbathing. Does anybody know why they swim near the surface when the sun is shining ? What sort of fish are they ? Saturday saw a record 82 members / volunteers mucking in to knock the Club surroundings into shape. alias Dave Preston and Lynda Gilbert. 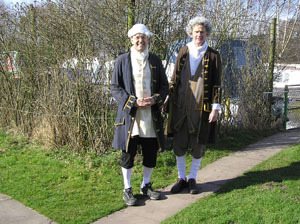 The recent Dr Samuel Johnson 300th birthday celebrations included the 165-mile walk from Lichfield to London by Professor Peter Martin and Dr Nicholas Cambridge, dressed as Samuel Johnson and actor David Garrick, commemorating the journey that the pair made 272 years earlier. This involved a 10-day trek along the towpath to London, meeting up with civic leaders en route, before they were welcomed by the Lord Mayor of London at the capital's Guildhall. 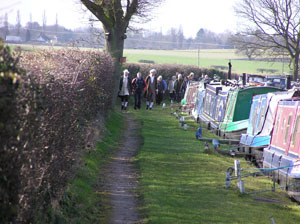 The walk included walking the length of the Club moorings, arranged in conjunction with the Lichfield & Hatherton Canals Restoration Trust, before joining the Coventry Canal towpath at Huddlesford Junction. 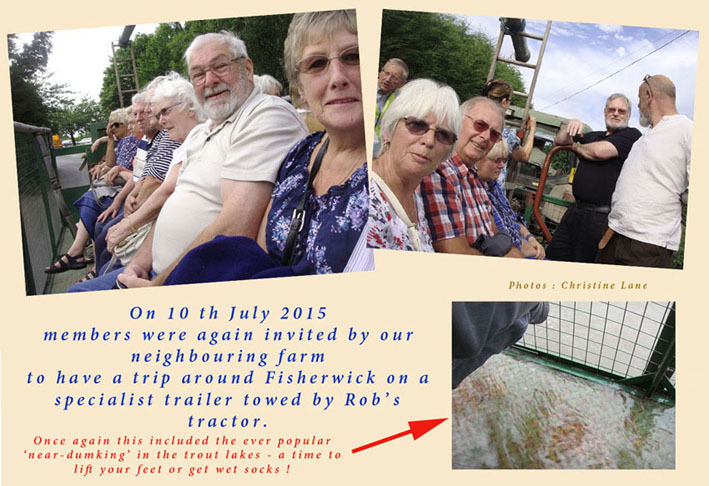 Lichfield Cruising Club will be the venue for the next SOW meeting, to be held on Saturday, 11th October. Doors will open at 10.30 for an 11.00 start. There will be a break for lunch around 1.00pm, with the afternoon session commencing about 2.00pm. John Edmonds, Chair of the Inland Waterways Advisory Council, will set the tone for the meeting with a talk about the role of the IWAC, and how the 1999 paper, "Waterways for Tomorrow", has taken a central role in current and future government policy. There will also be oportunity to discuss current and future campaign strategy. Non-members are welcome. The BW stoppage outside the Club has now ended. The work to the culvert was completed ahead of schedule, despite the start of the stoppage being delayed several times. Initially the contractors had planned to start the stoppage on November 5th, but this conflicted with the date of November 12th published by BW in their stoppage list. The published date had to be honoured, and by the time the error was spotted, the contractor was unable to re-schedule the intallation of the temporary dams until the 16th. When the dam installation team started, however, they discovered that the planned location for the dams was too deep. The alternative dam locations chosen necessitated the moving of more of the boats off the main line moorings, which meant that the dams were not finally installed until November 20th. The photo here was taken during the first abortive attempt to install the dams in our oh-so-deep canal. Despite these early difficulties, the contractors, Morrison Construction, have completed the bulk of the work to get the canal open again ahead of schedule, whilst at the same time causing minimum disruption to Club members. Well Done! 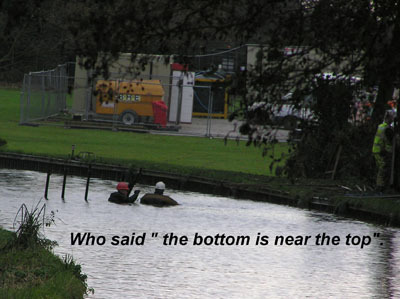 Those Club members who moor on the main line can now sleep easier at night in the knowledge that their boats are not likely to disappear "down the plughole", which undoubtedly would have been the case had the culvert failed! Members of Lichfield Cruising Club have had their cruising seriously curtailed since the middle of November as British Waterways carries out vital repairs on the Coventry Canal. A hundred metre long stretch of the canal outside the LCC Clubhouse has been dewatered while a culvert - an under-canal tunnel - which safely routes a brook, is repaired. 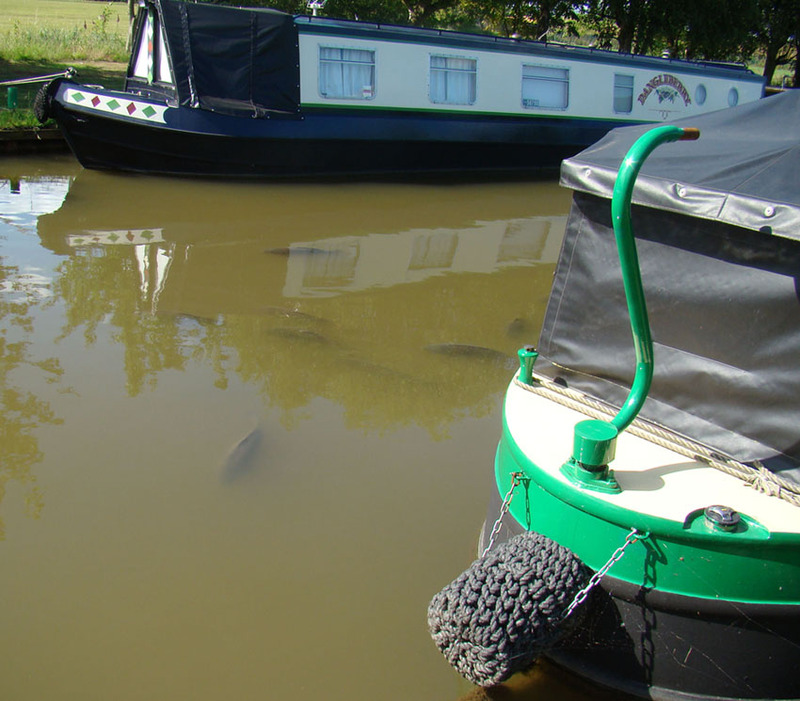 As well as preventing members from cruising up towards Tamworth, the work has meant six members' boats have had to be temporarily moved from the main-line and breasted up in the Huddlesford Arm. 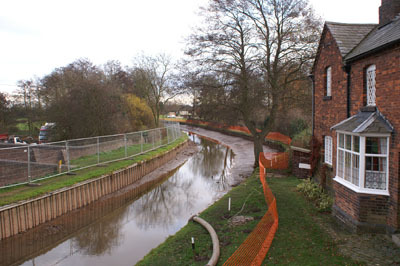 The project is expected to take a month and it is hoped the canal will be open again in time for Christmas. Meanwhile some of those members who moored in the spot have been seen desperately trying to find a variety of objects previously lost in the canal. One member wanted to recover a hard rubber dog toy and a chinaman's hat, without any success. The work is being carried out by Morrisons' Construction on behalf of BW, and they have installed a works compound on the Club field and large pumps to carry water from the brook while the work goes on. It had originally been planned to dewater only a short stretch but as the dams were being constructed it became clear the canal was much deeper than expected and they had to be re-positioned. 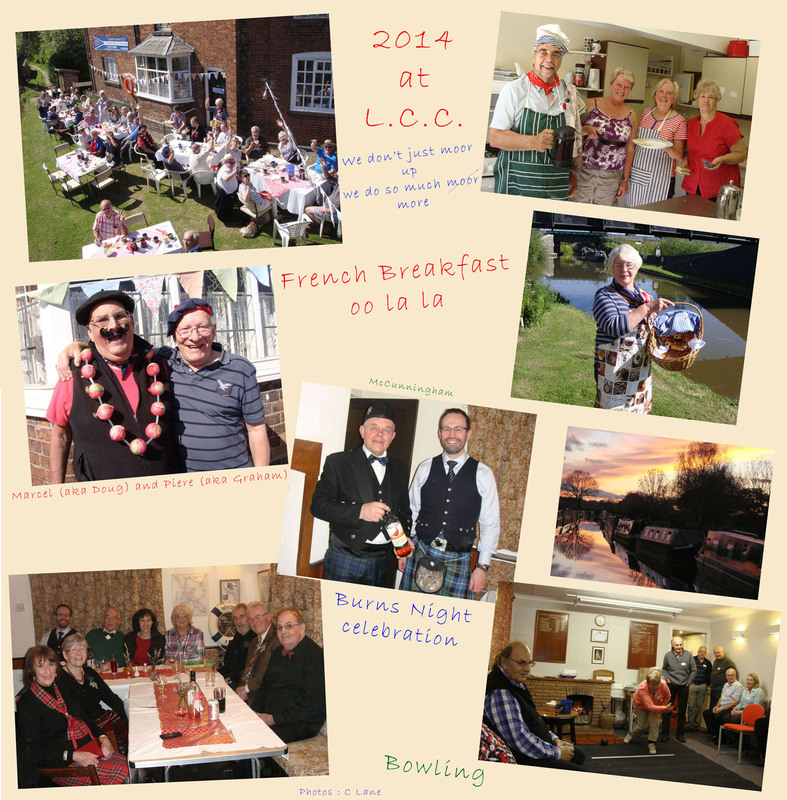 The Lichfield Cruising Club website is now live. Some areas are still unfinished, and these will be enhanced over the coming weeks. In the meantime, if you have any constructive comments, or are experiencing any difficulties, please e-mail the webmaster (see Contact Details page).